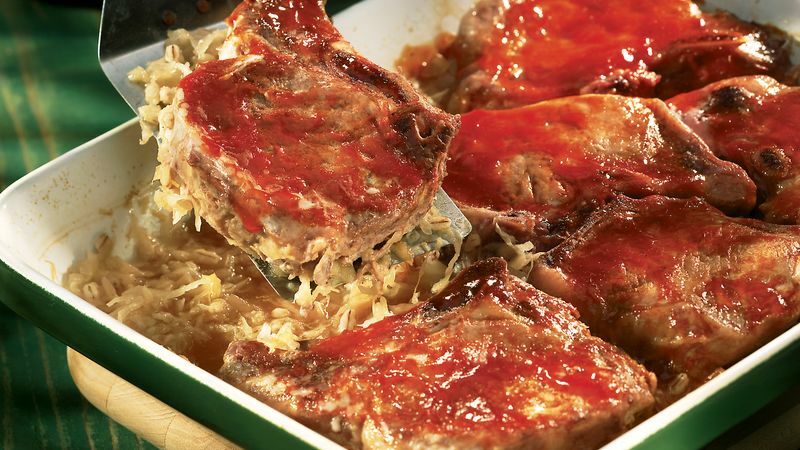 Mix sauerkraut, apple, onions and barley in ungreased 2 1/2-quart casserole or rectangular baking dish, 13x9x2 inches. Place pork on sauerkraut mixture. Spoon barbecue sauce onto pork. Cover and bake 1 hour 15 minutes to 1 hour 30 minutes, uncovering for last 15 minutes, until pork is slightly pink when cut near bone, barley is tender and liquid is absorbed. Sauerkraut, which translates as “sour cabbage” in German, is shredded cabbage that has been mixed with salt and allowed to ferment. Apple varieties such as Cortland, Rome Beauty and Winesap remain flavorful and firm even after cooking.